March 22 is World Water Day, a day dedicated to focusing attention on the importance of water. 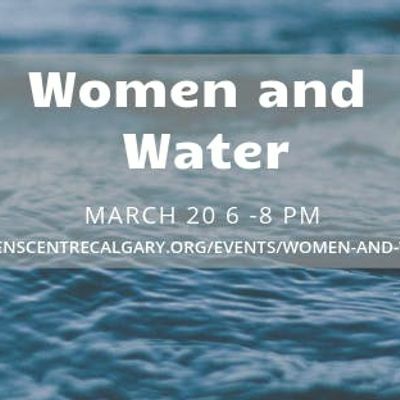 Mark World Water Day a couple of days early, by joining the Women’s Centre of Calgary and guest presenters March 20 for an evening exploring water in the context of Southern Alberta. This event will include a “Get to Know Your Watershed” workshop, exploring water quality, water quantity, and threats within the Bow River Basin. Facilitators will guide the group in a discussion about water monitoring, and will explore “big-picture,” issues like water policy, and the intersections between gender and water.Participants will learn from a group of female scientists about how water quality and water quantity is monitored and evaluated in Alberta, and there will be interactive stations to learn about groundwater systems and surface water/groundwater interaction, brainstorming threats to water within the Bow River basin, and perform water quality measurements using a citizen science laboratory from Calgary’s non-profit group, RiverWatch.This event is free and open to anyone who identifies as a woman. Snacks will be provided, child minding is offered on site for children 19 months to 12 years of age.We would like to acknowledge that the Women’s Centre is situated on the traditional territories of the Treaty 7 First Nations people and is also home to Métis Nation of Alberta, Region III.